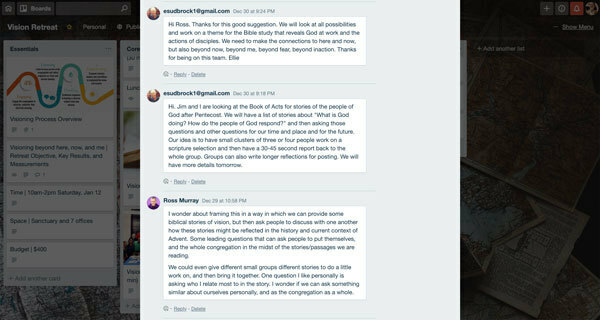 Editor's Note: This is the 2nd of 3 special emails about our upcoming visioning process at Advent. Please forgive the extra emails, and understand our intention to make our visioning process as inclusive and transparent as possible. The 1st email presented an overview of our visioning process. This email will take you with the Vision Team through the formative work of this process. The 3rd email will be about what to expect at our Vision & Mission Retreat, and after the retreat. Thank you for your engagement and excitement as we launch this inclusive, collective, Holy Spirit-led visioning process for Advent's future. We are excited! And we hope you are too. On October 17, 2018, our Congregation Council gathered at the home of Brelyn for their monthly meeting. They were greeted by the family dog. You could hear the footsteps of Bree's two sons upstairs. The Council had just poured months of hard work into the congregational meetings in September regarding our present financial and building needs, and listening to the many responses of the congregation. Now they had to decide: What is the next step we should take as a community? Council had always planned to explore vision and mission as part of our journey forward, and the feedback from our gatherings verified the importance of engaging an inclusive, collective, Gospel-inspired, actionable, and Holy Spirit-led visioning process together. Our shared vision and mission is the foundation of any decision we make. Therefore, our Council established a team to explore and refine the vision and mission for Advent. 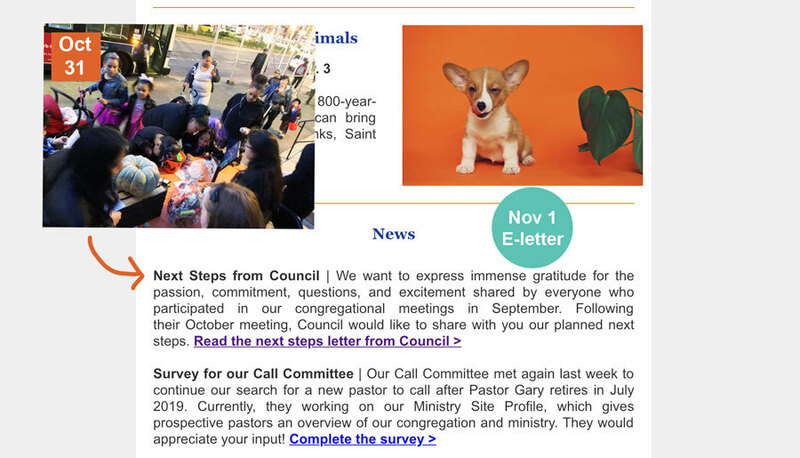 Our Council President, David Richards, shared an official update in our weekly e-letter on November 1, a day after we handed out candy to hundreds of families on Halloween. First, our council, pastors, and staff developed a working proposal and potential roster for the Vision Team. 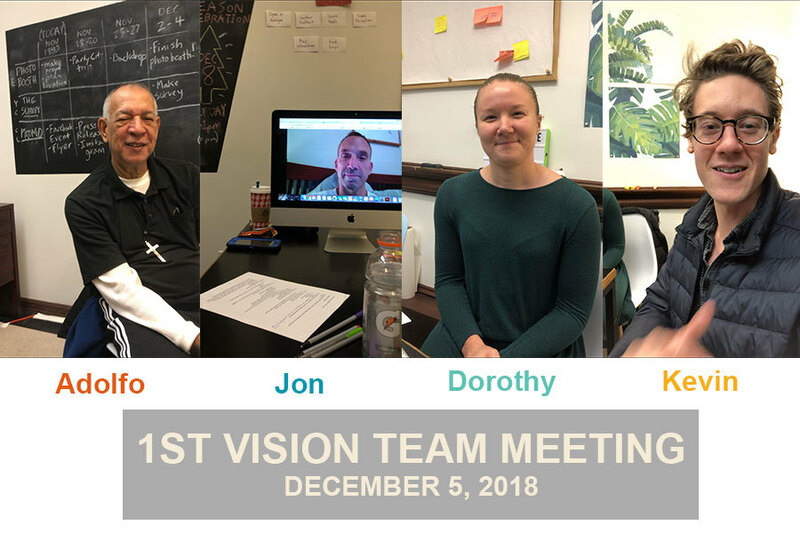 On Tuesday, November 27, our Vision Team co-chairs, Jon, Dorothy, and Kevin met to build out a framework and strategy for the visioning process. To the right is a picture of some rough notes from that first meeting. We started small, adding Deacon Adolfo Ramirez to our group of 3 co-chairs, but the passion, energy, and insights of our team were abundant. In particular, Adolfo helped us understand the intention and approach it would take to engage some of our Spanish-speaking members, who due to church background, were not used to being included in a process like this. With ambitious goals for engaging the congregation, and finding ourselves in the busy Advent season, we quickly launched a multifaceted outreach strategy. 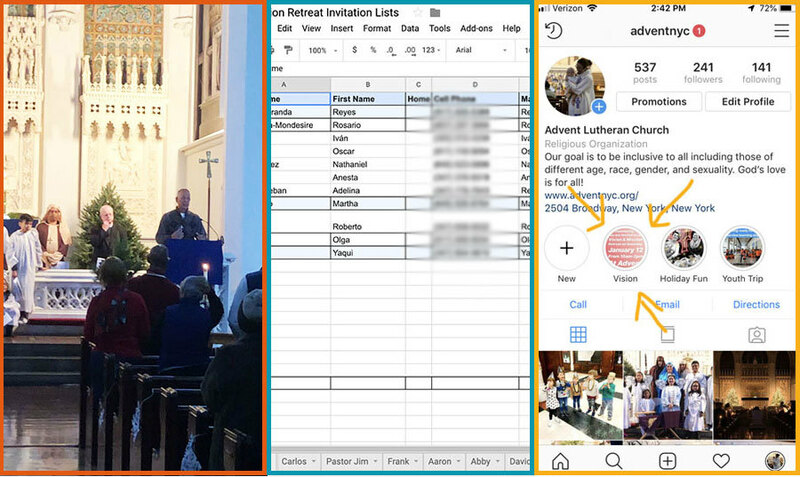 Wednesday, December 12, we divided the congregational roster into outreach lists sent to 24 Advent leaders, praying that (with follow-up) they would find the time in this busy season to make every call. We worked hard to get information onto our website, e-letters, announcements page, flyers, and around the building as quickly as possible. We even started an ongoing Instagram/Facebook story to bring people into the process with us. We thought carefully and extensively about our stages and guiding principles for our visioning process. These would be the roadmap and compass for our whole process. We drew from a wealth of collective experience at Advent, reading and research, expertise in our respective areas of work, and our faith. 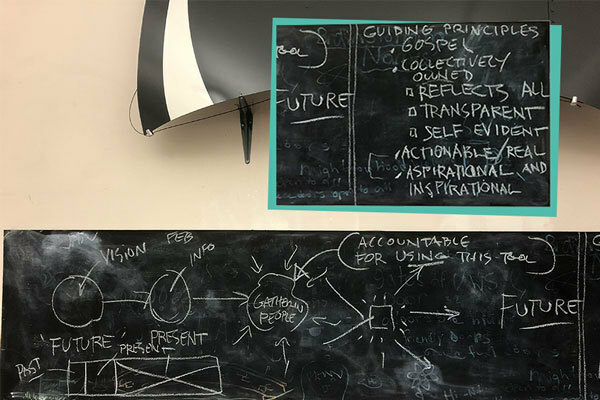 In less than a month since the first chalk sketches on the blackboard of Advent's youth room/office, our visioning process stages and guiding principles were up in English and Spanish on Advent's website. A small group developed the objectives and rough outline of our retreat activities at our 2nd team meeting. At our 3rd Vision Team meeting (and last meeting before the holidays) on Monday, December 17, we gained two new members, Ellie and Jennie, dove deeper into retreat planning, and assigned planning roles. Over the holidays, we had to accomplish a great deal of retreat planning remotely. We utilized a shared planning board online (and also, lots of emails and phone calls) to collaborate and coordinate. Gradually but steadily, our Vision & Mission Retreat was coming together. Today, we left our 4th Vision Team meeting feeling inspired, confident, and energized to embark on this visioning process with our faith community here at Advent. Now, having laid all the groundwork, we invite YOU to join our inclusive, collective, and Holy Spirit-led visioning process at Advent! At our Vision & Mission Retreat next Saturday, you will have the opportunity to engage with Advent's history, our surrounding community, the Gospel, and Advent members to think about vision & mission in new and exciting ways. This retreat will be a launching point for our 4 visioning process stages -- engaging, listening, distilling, and empowering -- to unfold with many opportunities to participate throughout the coming months. 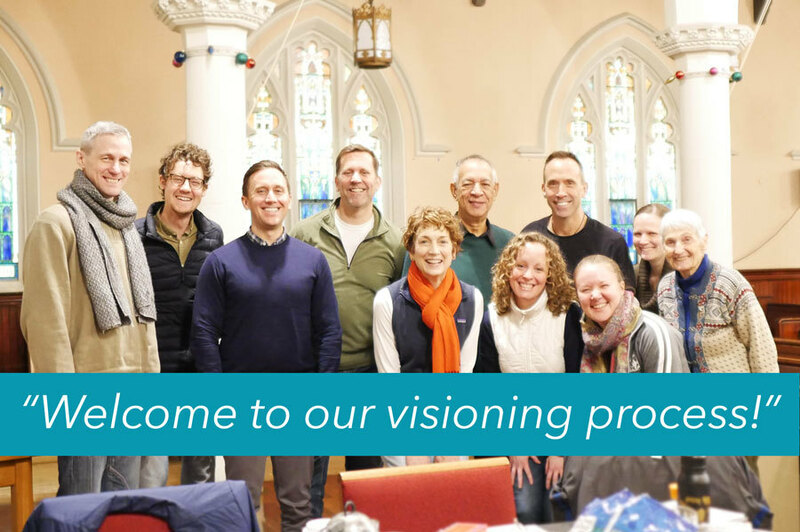 We are so excited to welcome you into Advent's visioning process beginning in one short week at our Vision & Mission Retreat in our sanctuary next Saturday, January 12 from 10am-2pm.